These are the parts of your door that do most of the heavy lifting. 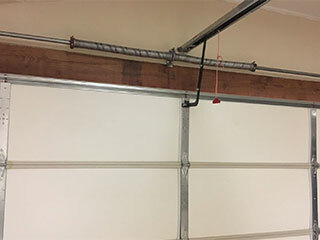 Garage door springs are responsible for supporting and counterbalancing the weight of the panels, and therefore they will inevitably break after being used for a certain amount of times. Trying to repair, adjust or replace these components by yourself is a very bad idea, as the tension stored in their coils can cause them to break and whip around, which can cause severe lacerations to anyone standing nearby. When it comes to residential garage door installation, the choice of spring is extremely important. If you choose our team for the job, you will receive a detailed explanation and expert advice on the different options that you can choose from. Most homeowners prefer to go with torsion springs when they can, as these units tend to be more reliable and longer-lasting compared to their extension-based counterparts. There are two options within this category. Galvanized torsion springs are suitable for residential door panels of standard weight that see an average amount of daily use. If you have a larger and heavier door and/or you and your family members tend to use this system more often than most, we can install an oil tempered torsion spring that will ensure the door's optimal performance. You can expect it to work well without lubrication maintenance as the steel wire was dipped in hot oil during the manufacturing process, so it doesn't require this type of upkeep. If your garage door has become harder to open or you have to lock it in order to keep it closed, the spring system may have too little or too much tension. Count on our team at Garage Door Repair San Ramon to run tests and pinpoint exactly what's wrong with the system. If you have a torsion spring, we’ll use winding or unwinding techniques to increase or to reduce its tension. Extension springs that have been weakened and can no longer do their job properly will simply be replaced. Deformed coils are also among the common issues that can affect these devices, so we will make sure to look for them while we work, to let you know whether replacing these units is necessary. You can rely on our experts to replace your springs when they break and to keep them in great condition throughout their lifespan. One of the key things when it comes to extension spring installation is to run a safety cable through the unit, as it serves as an anchor that keeps the unit in place when it breaks. Whatever type of service you need, our team can deliver excellent results. Use our online system to schedule a service appointment today.